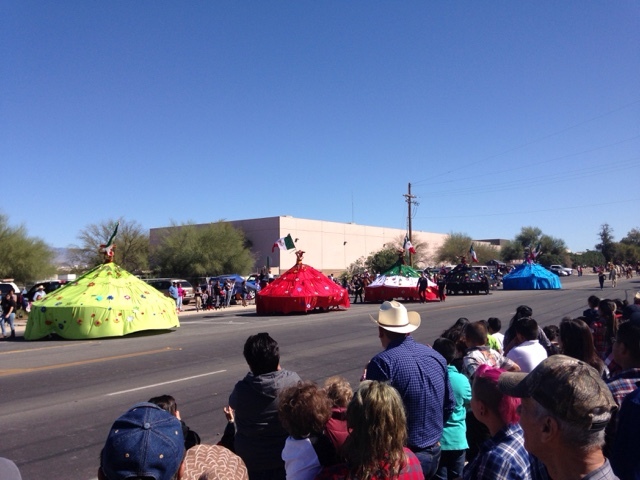 Today is Thirsday and its Tucson Rodeo Parade Day. 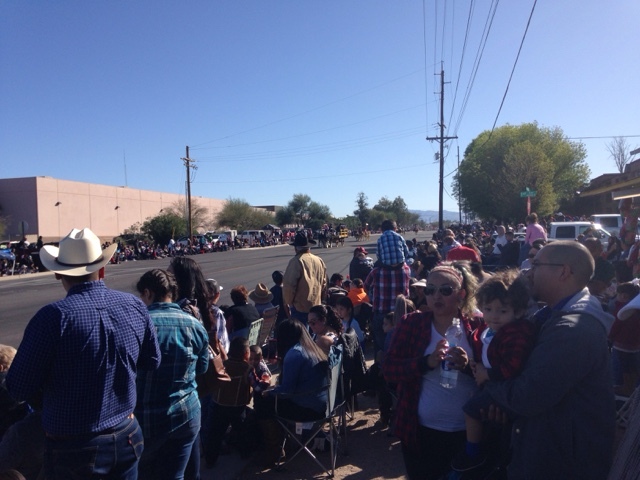 The paid parking at the Rodeo Grounds opens at 4:00 am and the parade starts at 9:00 am. With a parade of 1.5 miles I figured I would find some place on the parade route and not pay for parking. Grandstand seating across from the Rodeo grounds is $10.00 but I will bring my camp chair. 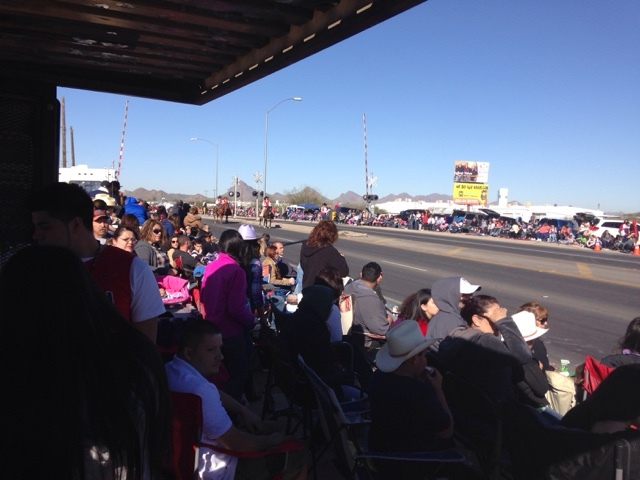 I was up early and found a spot to park on a side street not too far from the grandstands and only a few hundred feet from the parade route. It was 6:30 am and 36 degrees and people were sparse but yet they had already staked out their spot. I stayed in my car until 8:00 am with people filling in around me parking for some distance, walking past me towards the parade route. It was now 55 degrees. I had been listening to podcasts while I was waiting. When I got to the end of the street, where the parade route was, there was still some space to get a front row seat, but I opted not to use my chair and decided on a spot under the bus stop, with my eye on a cross bar of the bus stop to sit on to be above others. The pictures above shows the crowd at the start of the parade past us. With all the children present I gather there was no school today. 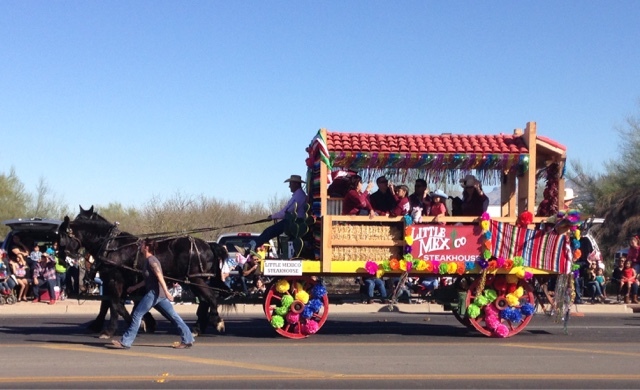 This is a very large parade with all horse powered floats/transportation. I took a lot of pictures and will only share a few. 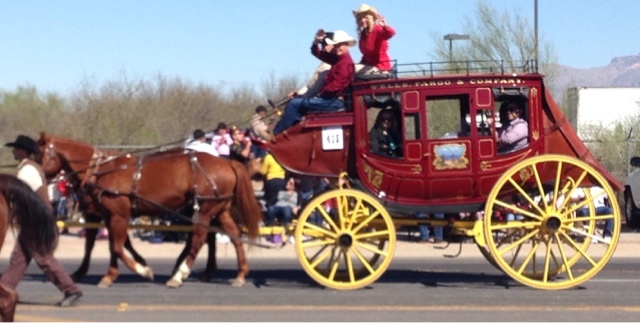 There were parade officials & politicians in all varieties of wagons and carriages. There were all kinds of social groups that have entries. It appears that each high school had their marching band in the parade also. This is a Spanish reenactment group. Businesses were also included. The gecko from GICO brought a lot of interest from children. This is my pick of the nicest piece in the parade. 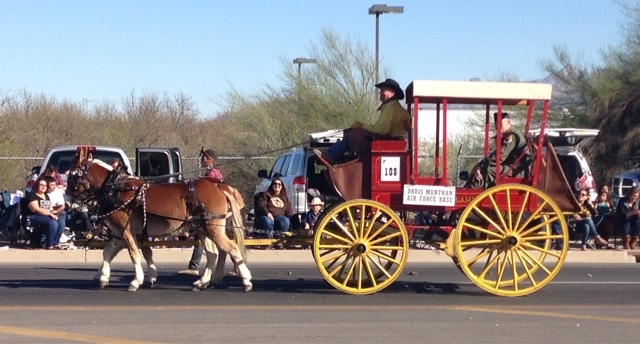 It appeared to be fully restored and well maintained stage coach. 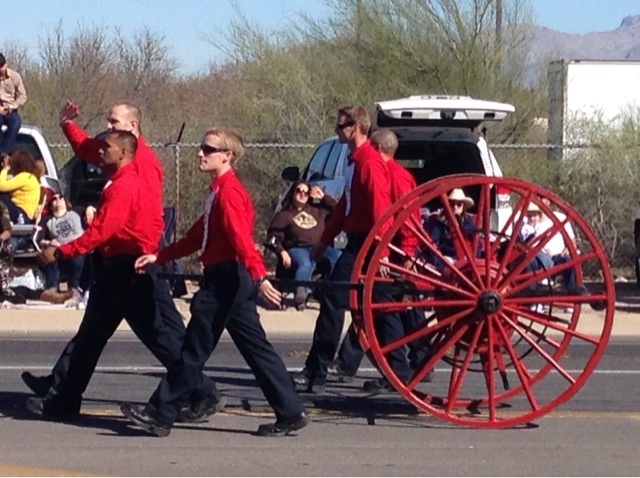 The Tucson FD had two identical hose wagons they pulled. This stagecoach was my pick for runner up for nicest piece. 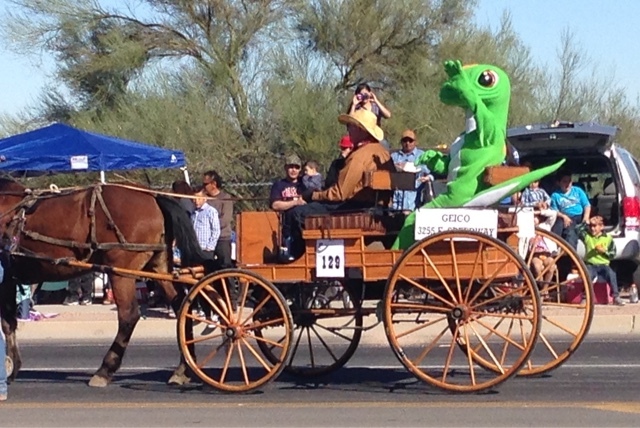 This was the most unique entry in the parade. 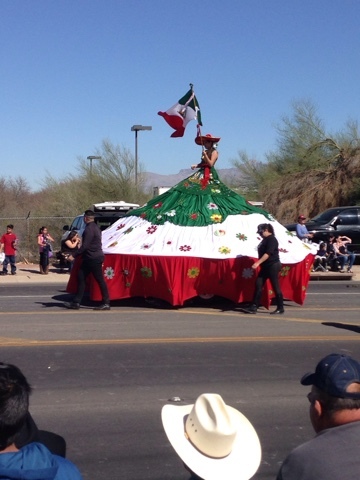 4 colorful Mexican dressed woman with the tallest largest hooped skirts. There are horse/s (I could see horse legs under the skir but that's it) underneath them to move them forward. The large dressed woman was very different and interesting. About the parade. The parade was nice but it had periods of large gaps. I was near the end of the parade route and it took a half an hour for the beginning to get to me and was 2 hours long. It easily could have been 1.5 hours long vs 2. It appeared to be boring for younger than 7 or 8 year olds. There was no fun! No candy throwing and no kids stuff. One such child bored decides to take a full can of Seven-up soda and smash it with his foot. The end towards me blew a seam and yes I got it all over me. All these people and it sitting in the crossbar above others but it sprayed up at me. My pants, shirt & coat got wet. The mother tells the kid to come to me and apologize, but he does not. The mother finally says she is sorry from behind my back. I don't turn, but say it will be ok. I wasn't mad as everyone was a kid once and like me, did goofy things. I will survive and I was planning to go to the laundromat after the parade anyway. I don't blame the kid for being bored but parents should anticipate this and plan ahead. The parade was nice but it's doesn't rate a yearly destination for me. You were pretty patient to not get upset with that kid! !